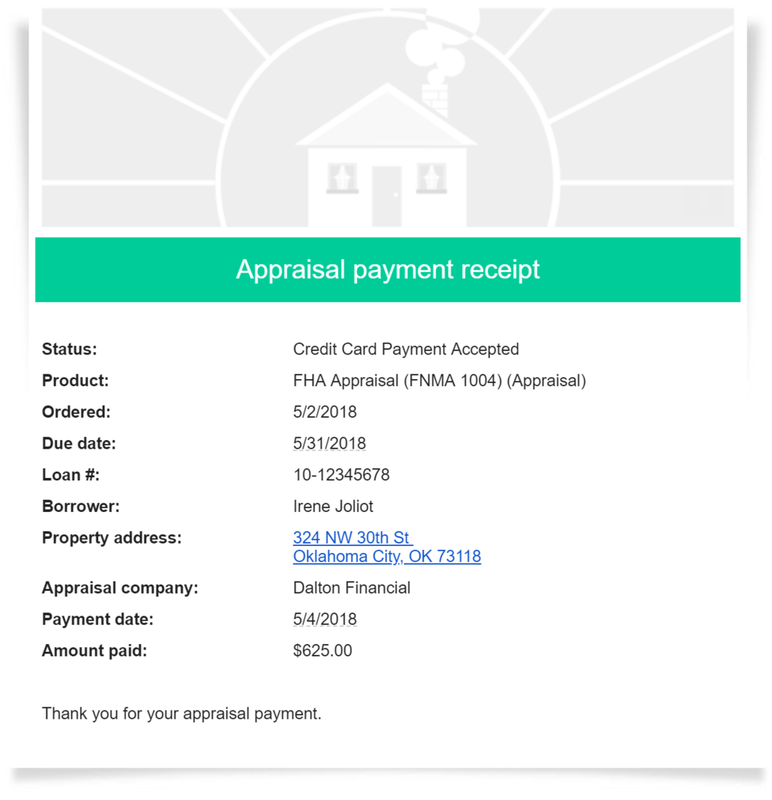 In this update, we're excited to introduce a completely updated experience for borrowers when they pay for their appraisal online. Everything—from the notification emails to the payment web page—has received a face lift and is now completely mobile friendly. Before you can start using these new features, we'll need to enable them for your account, so read on to find out how to set that up, and check the release notes for details about the other changes in this update. When an order is placed with a payment method of Deferred CC, the email which is automatically sent to the borrower has been updated with a new design that's consistent with the rest of the borrower's payment experience. You can customize the message in this email, and we'll help you set it up when we work with you to enable the new payment system. When the borrower clicks Pay Now in the payment request email, they'll be taken to a secure page where they can enter their payment info. Of course, it's designed to maintain a consistent experience throughout the payment process, but another great thing about this new page is the fact that it's completely mobile friendly, so they can pay using any device they prefer as long as it has a web browser. When the borrower's payment has been processed, a receipt will automatically be sent to them via email for their records. This message has been designed with the same look and feel as the other steps they've seen during payment so they know it's all part of the same, secure payment process. To get started using the updated payment features, we'll need to enable them for you. It's a quick, simple process where we'll help you set up your customized messages for the emails and a couple of other options. So, call Client Relations at 1-800-900-4954 to get started, or you can click here to schedule a ½ hour consult ahead of time to fit your schedule.